I've had a very unproductive two weeks. Our writers' group meets again this Thursday. I haven't done the math, but think I've written about 5 pages total. Edited another couple. Not what I needed to do. We have been busy around here in the non-writing part of life. We are still looking for a home and have been stepping up our efforts there. We've also been keeping some late nights just doing things that need to be done around the apartment. I should have been writing int he mornings, and I have some days, but not as much as I should have. I need to be better, but I am having a bit of trouble balancing the writing life with the regular life. Combine that with having to find time to edit and I am feeling a little overwhelmed at the moment. I know this will get easier the longer I do it and I'm still new in my pursuit of writing. But patience has never been one of my virtues. I want to have this figured out and have it figured out yesterday. I am starting the process of editing a story I finished a little over a month ago. This is something that I've never done before and kind of figuring out the way I want to do it. The editing isn't the issue, I do that every day at the job that pays the bills. What I am not sure about is whether or not to save a new draft each time I edit, or just edit the one file. I am going with the new file method for now. Seems best to keep older versions around in case I just royally screw things up in the editing process. If anyone else has a better idea on how to approach this I'd like to hear it. 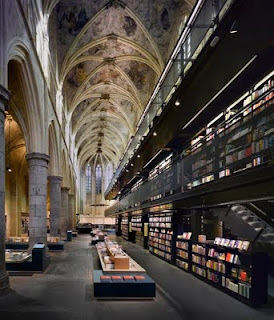 People in the Netherlands get to shop at this bookstore. And to think, I like going to the local Borders and Barnes and Noble. Here's a fact that baffles both me and my wife. I like reading young adult books. I haven't been able to boil the reason down to one nice sentence, but what I have worked out goes something like this: Young adult novels have plots that are just as complicated as adult novels, but they move faster. At least for me that's true. I have read most of the Percy Jackson series by Rick Riordan and most of the Artemis Fowl series by Eoin Colfer. All of the books that I've read in each of those series start with a bang and keep chugging until the end. The Artemis Fowl books seem more "adult" in nature as they are about a child who is a criminal mastermind. Jeff Vandermeer has an interesting interview with Eoin Colfer over at Amazon's Omnivoracious blog. Colfer has written the next installment in the Hitchhiker's Guide to the Galaxy series. Go check it out. It's a fun read with lots of personality coming across in both the questions and the answers. Just the kind of Q&A that I like. I wrote a previous post on where ideas come from. Saw a book in a box and the title gave me an idea that turned into a short story. I think ideas are interesting. I think process is interesting. But I have never been one to buy into the idea that every single piece of literature has some deeper meaning. I am not much for symbolism. I don't doubt that there are some writers out there who think long and hard about what name to give their main character so they can make sure the proper "bigger message" is conveyed. I started thinking this way in college after I took an English Lit class. The professor, a woman who had focused her studies on feminist literature, was having us read Frankenstein. We spent the time before reading the book hearing the story of what caused the book to be written. Essentially, Mary Shelley was having a contest with her husband and a friend to write the scariest book possible. I found that interesting. Kind of a neat way for a classic to come about. Then the professor told us that Shelley made all of these choices about setting and character names and situations to make bigger points on women's place is society. I didn't buy it. If Shelley was trying to win a contest about who can write the scariest story I don't think she was also trying to figure out a way to make bigger points. The thing that put me over the top, though, was the day that the professor pulled out a newspaper page. You pull out a newspaper page then you are talking my language. On the page was an illustration of a sperm wearing a top hat and swimming through a sea of red. The professor then asked why we thought the illustrator and page designer chose the colors they chose for the page. Her argument, the red represented a woman's menstrual cycle and the top hat on the sperm was there to signify the dominance of man. Others in the class nodded their heads. Some asked questions. I raised my hand and asked what the story the illustration was paired with was about. I don't remember exactly, but I think it about sperm banks that catered only to exclusive clients. I made the point that red popped on the page and captured the readers' attention. Sperm are white and top hats said high-toned. There wasn't a deeper meaning other than "high-class sperm bank." She laughed me off and said something about needing to think bigger. And that's the story of how I lost my belief in symbolism. One of the first links that I ever added to the right side of this thing was to Gabriel Novo. He is the Cuban Nomad. He's doing the same thing I am -- working had to become a published writer. He said some nice things about me in a post of other writer blogs that he reads. He's right. There are a boatload of aspiring authors out there, but it helps to find others to which you relate. That's why I liked his blog as soon I found him from the comments section of another writer. So, thanks, Gabriel. And those of you aren't Gabriel, go check him out. I just walked by one of the TVs here at work and it was tuned to CNN. the headline they had on the story that was being reported at the time was "Can anything stop music?" I think the Village People would say asked and answered. I have a short story that has been in my head a lot lately and it's one of the pieces I want to work into the rotation I talked about in the last post. I've written 2,700 words so it may turn into more of a novella since I know how it will end and we have a long way to go before we get to that point. I think I stalled out on the writing because even though I know the ending I don't have any of the points in between planned out. I need a very rough outline with at least three plot points planned before I can move on. That's the first thing I'll do when this story gets its turn. Here's an example that doesn't give away too much of what happens. The blue glow on Riley’s face disappeared as the bank of monitors in front of him blinked off. His back popped as he twisted in his chair and set his input pad in its charger. The fuzz in his head had all but disappeared. He still wasn’t completely himself, but he was doing a good job of fooling the co-workers who’d stopped by his desk the last hour. Brenda was waiting outside of his cubicle with her jacket over her arms. She smiled and he held out his hand as he passed her. She grabbed it and they walked to the elevator. “Not the express today?” she asked. “No, not today. Think we’ll take the regular elevator.” He squeezed her hand and she slid a step closer to him. On the elevator he turned to her. When the doors opened on the bottom floor she had tears in her eyes and was telling him she understood. We had our writing group tonight. One of the members -- one of three -- asked the others what the thing that kept them from progressing in their writing. One of the other members -- that would be the one that isn't me since this person didn't answer his own question -- said that too many ideas and things that he wanted to work on kept him from making significant progress on any one thing. I said that I had a similar problem. At times, I find it hard to focus my attention to just one project. Right now I have the book and then two short stories that are fighting for my attention. The other member said that he had been giving each project one day of focused attention. Then the next day he worked on another project. I am thinking that this is an idea that I may try. I'll just rotate through them. I'll do the novel one day, a short story each of the next two days. The fourth day I'll devote to revisions. I have two pieces ready now and am soon to have a third. Those first two have been sitting untouched in a file for nearly a month now. I think enough time has passed to allow me to take a first pass at editing. I've forgotten enough of the stories that the writing will seem fresh and I can, hopefully, find some holes or places where the story doesn't work. I am curious if any other writers work like this. I know that my process is my process and I can't go comparing myself to others, but was just wondering if there was anyone with a similar experience and how it worked for them. Talking as much as I do about the writing process, it stood to reason I'd like this short comic on where ideas come from. Click the link, by the way. There's more to the comic than the image below. That's just to give you a taste. 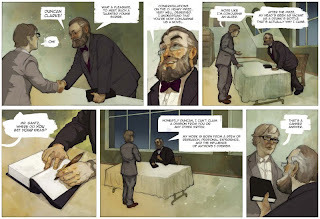 And if you like this one the same artists have a serial story going up at the same site. A new page is being posted each Thursday. It's called King of an Endless Sky. Those start here. I added the progress counter widget to the right side. It will show how well I'm doing on the novel. I toyed with the idea of adding a counter for other projects, but right now my focus is mainly on the novel. I don't work regularly enough on the other pieces to make a counter worthwhile. I think they'd just serve to depress me seeing them not moving. Anyway, you can follow my progress now. Thanks, Steve, for the link to the widget. What has happened to Tom Cruise? And to us? Gina and I climbed into bed last night at 9:15 p.m. and popped Valkyrie into the DVD player. It had arrived from Netflix the day before. She was exhausted and looked like she was falling asleep before we moved to the bedroom for the movie so I didn't expect her to last long, and she didn't. She may have seen 10 minutes of the movie, tops. I didn't last too much longer. I watched about 20 minutes of the movie. I was getting frustrated because I couldn't understand anything they were saying. It's all about a conspiracy to overthrow a government so I didn't expect them to be shoutign thigns to each other. Secrecy is a big payer here. Got to whisper. But I don't think I understood half of what the actors were saying. I was also struggling with Tom Cruise as a Nazi officer. Honestly, I struggle with Tom Cruise as anything now. Every since he had his couch-jumping fit on Oprah and his Scientology video leaked on the web I can't see him as anything other than a little crazy. It takes me completely out of the movie because I don't see him as the character anymore. I'm always thinking, "That's Tom Cruise." I didn't used to do that, not until he screwed up his image, at least in my mind. I'd had enough of struggling to hear the actors and by 10 p.m. I'd stopped the movie and turned on the news. By 10 p.m. on a Friday my wife was asleep and I was soon to follow. What happened to us? I can guarantee you that my parents were still awake at that time. So sad. We are celebrating my brother's birthday today with family then hopefully going to the Rangers game tonight. Well, we are going ot the game. Hoping they play since we are supposed to have rain all weekend. I am hoping to write a bit tonight. Have fallen off the last couple of days. It's been a rough week at work with a rougher week coming up. We have a project that will be wrapped up next week and that may mean some long days. I have written 11 of my 20 pages for the critique group. I should be able to get nine more done this week, but if I don't, I don't. I am not going to sweat it. I have to keep reminding myself that this is something I am doing for me. It's not a class and there are no grades. No one will be upset if I don't make it to 20. Other than me, of course. I wrote a bit before work this morning and passed another magic mark on my long piece, which I will now be calling a novel. I wrote 425 words and that got me about 100 past the 20,000 word mark. I am in the middle of what is Chapter 9 and am still working my way to the story's climax. I have my protagonist and a secondary character being held captive by a rag-tag group right now. They are about to escape and the race that was the big idea I had when I started this book will be on. I am happy to be at 20,000 words but it's also a bit depressing to know that I have about 60,000 words to go to be at a finished novel. I may need one of those Work-In-Progress widgets I can put up and keep track. UPDATE: Wrote again at lunch and was able to bang out 500 more words. That puts me at nearly 1,000 for the day. With the writing I hope to do tonight I could get to almost 1,500 today. That would be one of my most productive days in a while. I have a thing about milestones. I like round numbers. Anniversaries of 10s and 5s are important to me. It may have something to do with my day job. In journalism we like to mark anniversaries like that with stories or photos. So, when I realized the other day that I was approaching 100 posts on this thing that I started as a whim I figured I needed to do something to recognize that. I toyed with the idea of just letting it pass. Make a post about something insignificant and just move on. But, no, that's not me. I thought about it the last two days and decided I'd explain a bit more about that little blurb in the "About Me" section to your right. I am a newly married man in my middle 30s trying to get serious about the one thing I have wanted to do my entire life -- writing. My entire life, huh? Well, no, not literally. But it's true that for a very long time this is what I have wanted to do. It was junior high -- seventh grade if I am not mistaken -- that I wrote my first story. If you had to categorize it it would have been fantasy. Trying to remember exactly what it was about and I can't. I know that it had something to do with a kingdom and a queen. She was under attack and had some sort of contest to see who could build the best weapon to be used in defense of the kingdom. I don't remember anything more about the story other than the title: The Man Who Made the Weapon. How bad and unimaginative is that? Unfortunately I don't know that I am any better at titles now. I don't remember any other stories from my very young days. I know I wrote a few others. I do remember a few phrases from those stories. "The convenience store was in the middle of nowhere, its plate glass windows like the eyes of a lonely dog waiting for its owner to return." And "His obituary read like the end of a bad romance novel." My dad particularly liked that last one. When my brother was in sixth grade he had the same teacher I had a few years earlier. He took my little file of compositions to her. She read them and commented on them. She said she liked them and that I should keep doing it. So I did. Off and on in high school I wrote some. I don't remember completing anything but do remember writing a few stories, on a typewriter of course, about a spy who lived above a diner in London. He liked dry toast and fried egg sandwiches. Obviously a different time since I don't know anyone now who would order a breakfast that includes four pieces of bread. This guy also liked his coffee hot and black if I am remembering correctly. In college all of my writing efforts went toward the student newspaper. I wrote there for two years and loved every minute of it. I was getting to be creative and seeing my words in print. What could be better? Once I graduated I took the first job I could and that was in copy editing. I was grateful to get to work in the same city I went to college, but I wasn't getting to write like Iused to unless you counted a weekly rodeo column. Instead I was editing other's writing and designing newspaper pages. I still loved what I did (and continue to do to this day, although I am getting to write more), but the writing side of me was starving. That's when I started writing fiction again. It wasn't something I was doing regularly, but I was doing it again. I started a story about two guys who were in college vying for the love of the same woman. Parts of it I liked. Parts of it were awful. And the story was taking way too long to tell with the same things happening over and over again. But I was getting my fiction legs back under me and it felt good. There are some parts of that story that I still really like. Maybe not the writing, but a few of the ideas are solid. It's been sporadic at times, but I haven't stopped writing since then. I joined online groups to try and keep myself writing regularly. Sometimes it worked and sometimes it didn't. But I have a renewed commitment that I have been able to keep up for at least the last few months, and honestly I don't see it stopping any time soon. Like I have said in previous posts, the ideas are coming easier and it's not such a struggle to find the words. I know that success now is no guarantee of success in the future, but writing is more fun than it ever has been. So there it is. That's my writing story, from junior high until now. And that's my hundredth post. Maybe not momumental, but hopefully interesting. I'll see you in another hundred and hopefully the updated story will include a completed novel and a few short story sales. The writer's group didn't meet this week. Not sure why but the guy who organized it sent an email Thursday afternoon saying he wasn't going to be able to make. It was a bit of a relief to me. I was iffy on whether or not I was going to be able to make it. We were working ahead this week at the day job so we could take the day off on Monday. That meant Thursday was going to be a long day anyway, so missing the group meeting meant a little more time relaxing at home. It also meant I got a chance to get a bit ahead on my longer piece that I am having them critique. I'd had 52 pages written going into the meeting. I'd given them 40 pages the first two weeks and was hoping to get 8 more done so I could give them another 20 this week. Didn't quite make it. I wrote 5 more this week after spending all of tlast week on a short story that didn't come out near as well as I was hoping. The ending that I had in mond when I started writing fizzled on me. I know that I could probably work it out if I kept at it, but the story isn't lighting my fire right now. It's OK, but not great and I knew I needed to get to work on the longer piece. So I abandoned the short story. Not happy about it, but probably the best decision overall. The short story wasn't a total waste. This was the second story I'd written with this same main character and the second time I'd played in this world. I got to figure out a little mroe about this place. I do like it, but it still needs some work. But it's work I'd like to do because I think there is something there. So, now I need to get 20 more pages written on the longer piece I have been working on so I can get ahead of the critique group. Last thing, the next post here will be Number 100. It's a mark I didn't think I'd make it to. I am not sure whether I want to do more to acknowledge it or just make it a regular post. As we each spend today celebrating the Internet's birthday in our own way, there are, no doubt, some who are cursing its birth. That bunch is lamenting what the Internet and technology has done to writing in our society. Well to that group, worry no more. Stanford University professor Andrea Lunsford has organized the Stanford Study of Writing. Between 2001 and 2006 she collected almost 15,000 writing samples. That included everything from class assignments to chat sessions. What she found was that technology is doing anything but killing our ability to write. Young people are doing more of it than ever and they are doing a good job of it too. Lunsford's team found that the students were remarkably adept at what rhetoricians call kairos--assessing their audience and adapting their tone and technique to best get their point across. The modern world of online writing, particularly in chat and on discussion threads, is conversational and public, which makes it closer to the Greek tradition of argument than the asynchronous letter and essay writing of 50 years ago. The folks at Wired did a good job of summarizing the findings here. When we were in Vegas in March there was a certain portion of our contingent who wanted to go to In-N-Out burger for lunch. They don't have them here and it's a place that several of us had been wanting to try. We never went, but if we had I think I'd have ordered from their secret menu. I won't explain it here. You probably know about it already anyway since it's not so secret anymore. Instead I'll just link to this blog post from Mental Floss. But not without quoting this little section on Wendy's. 5. If you’re at Wendy’s and you’re really hungry – like, three-patties-just-won’t-cut-it hungry – go ahead and order the Grand Slam, which is four patties stacked on a bun. It’s also known as the Meat Cube. Gross. I really want to order a Meat Cube.